Dog Muzzles for Labrador There are 33 products. 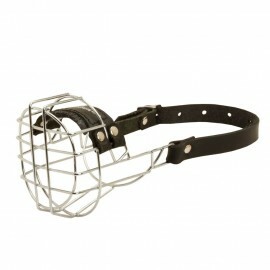 Strong leather basket dog muzzle for Labrador training and work. Handmade. Super ventilated. Very comfortable. Metal plate covered with leather in the front part. Stitched and reliably riveted. Felt-lined nose area. Adjustable straps. Supported with leather at each side. Absolutely safe for the dog. 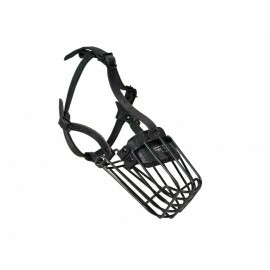 Light-weighted, safe, well ventilated and comfortable Labrador muzzle for daily use. Made of durable, dog-friendly and rustproof wire. Equipped with adjustable straps of natural leather. Felt padded nose area. Solid construction. Gives maximum comfort and freedom for the dog. Perfect for daily walking and training. 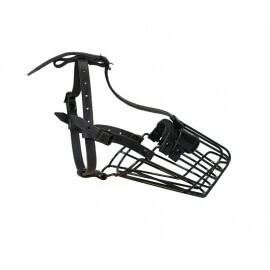 Reliable and comfortable muzzle for Labrador walking, training. Handmade from selected leather. Don't rub or wear into the dog's skin. Nose area is felt padded. Prevents picking up from the ground. Well ventilated. Adjustable leather straps. Removable strap between eyes. Metal plate covered with leather in the front part. Robust construction. 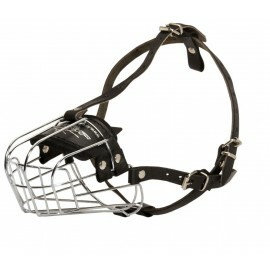 Super durable and perfectly ventilated wire dog muzzle for Labrador walking and training. Covered with rubber. Frostproof. Perfect for winter. Allows free breathing, barking, panting and drinking. Nose area is padded with felt. Makes it impossible to bite or pick up from the ground. Provides ecxeptional comfort and safety. 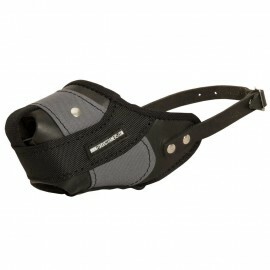 Comfortable, well ventilated and functional leather dog muzzle for Labrador. Made of thick and well-oiled natural leather. Convenient construction. Adjustable straps. Your Lab won't rub its nose because of felt lining on this area. Safe and non-toxic Labrador muzzle for walking, training and work. 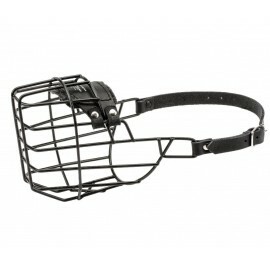 Light-weighted and comfy Labrador muzzle for daily use. Suitable for frosty weather. Combo of leather and nylon. Stitched with reinforced thread and riveted. 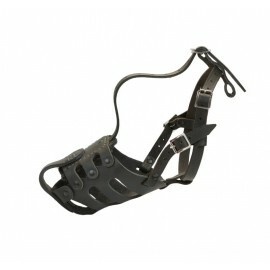 Leather strap will help to regulate the size and to fix the muzzle on Labrador's head reliably. 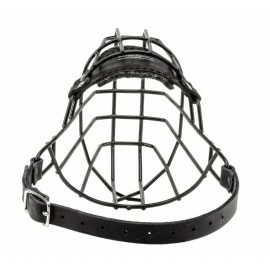 Good ventilation allows wearing the muzzle for a long time. No discomfort. 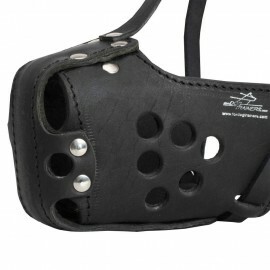 Leather dog muzzle of classic design and durable construction. Metal plate in the front part reinforces the muzzle and keeps its shape. Felt padding saves nose from rubbing. 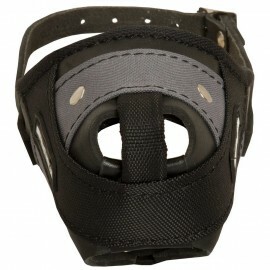 Regulated straps will help to fit the muzzle size and to fix it securely on Lab's head. Numerous holes provide good airflow. Your Lab can run and work being muzzled. Super durable muzzle for working Labrador. Made of high-quality thick leather. Keeps its shape perfectly. Riveted and stitched. Metal plate in the front part. Good airflow. Lab will breathe freely, open its mouth and lick nose being muzzled. Straps and buckles are for secure muzzle fixing. Ideal muzzle for service work. Light-weighted and well-ventilated soft leather dog muzzle for Labrador walking, training and socializing. Well-processed natural leather. Careful stitching and riveting. Regulated leather straps. Quick-release buckle (optional). Felt-lined nose area. The best Labrador muzzle for daily activities!